Though initially gathering in Pershing Square, a large public space near many financial institutions, organisers quickly opted to set up camp in the grassy park surrounding City Hall, just a stone’s throw from LAPD headquarters. The LAPD set up a command post inside City Hall, allowing for easy surveillance of the park and assigned twelve full-time officers to the protest. The activists, for their part, toed the line, dutifully moving their tents to the surrounding sidewalk each night at 10:30, in keeping with park rules. It was, as one sceptic noted, an ‘occupation by permission’. These Occupy LA media reps also took pains to praise the police for their restraint, sometimes revealing an odd belief that the cops were actually on their side. ‘The police are a part of the 99%’ was a popular refrain. Police were praised for ‘letting’ the protesters demonstrate. Occupiers were encouraged to keep their eyes open for ‘agents provocateurs’, a class of villain so broadly defined, that anyone advocating unlawful civil disobedience was deemed suspect. Those disagreeing with this rhetoric were often shouted down, as in this extraordinary clip of LAUSD teacher Ron Gochez being booed by protesters. Gochez noted with irony, ‘I had never seen cop-loving anarchists before. It was very strange’. Occupiers who were critical of the use of police liaisons formed a subcommittee against police brutality, and were subsequently smeared as agents provocateurs in flyers circulated at the camp. 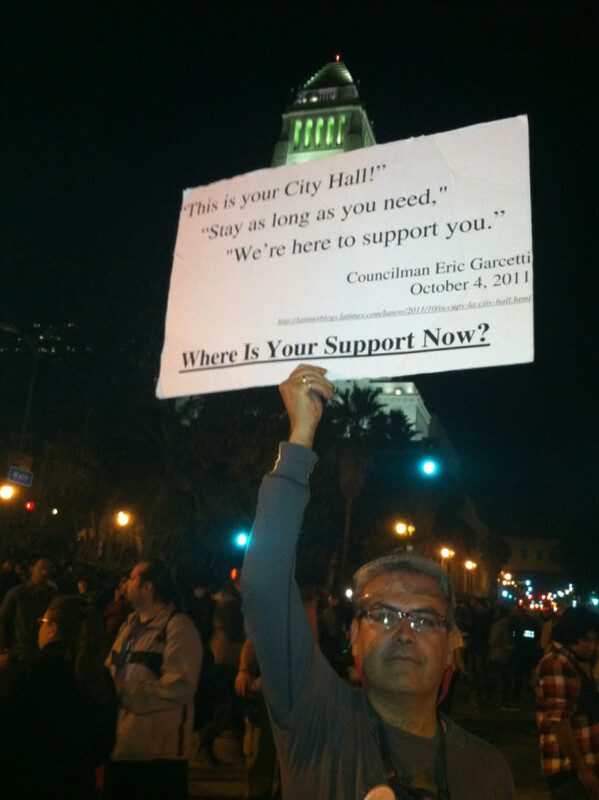 Mario Brito, acting city liaison for Occupy LA, participated in a radio debate defending the decision to work closely with LAPD, and distancing the group from police critics. As many from the downtown homeless population sought food and shelter at Occupy LA, the encampment faced new challenges and the city began to make noises that the camp had become a blight. Occupy LA itself became a microcosm of Los Angeles, organised along class lines, with a well-heeled area of the encampment unofficially dubbed ‘Westwood’ and a predominantly homeless section called ‘skid row’. Lacking a direct confrontation with the City and its police force, and divided over petty issues like the right to smoke pot, Occupy LA seemed in danger of eating itself from within. Then something changed. Perhaps inspired by the successes of Occupy actions in other cities, Occupy LA seemed to find a new sense of purpose in mid-November. One afternoon, protesters briefly shut down traffic and later occupied the Bank of America Plaza, owned by Brookfield Properties (the same company which owns Zuccotti Park,) leading to the first mass arrests of Occupy LA protesters. 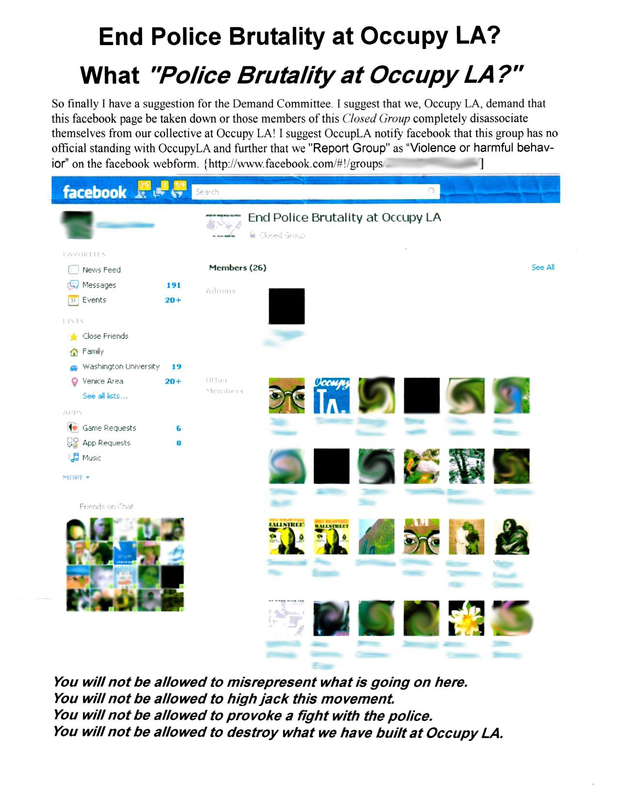 This time, at least, Occupy LA did not disown those who were arrested, and actively worked to bail out their comrades. There was one final echo of the old spirit of cooperation. On Thanksgiving Day, an LAPD commander donated two stuffed turkeys to the encampment. In a mixed message, the police also began placing signs throughout the park indicating that they would begin enforcing park hours. It was a darkly funny reminder of the First Thanksgiving – first we share this food together, then we drive you from the land. Unfortunately for the LAPD, the tranquilising tryptophan had already worn off by that Sunday, when they made their first attempt at an eviction. Police amassed with plans to give the protesters the boot, but were overwhelmed by large numbers of supporters who filled the streets in solidarity. The real eviction came two nights later, when an estimated 1400 police swarmed the encampment in less than three minutes, many of them pouring out of City Hall itself. This tactic was dubbed a ‘Trojan Horse’, an apt metaphor, given the fact that City Hall had been placating the protesters from day one. Mayor Villaraigosa gushed with pride for the LAPD’s handling of the eviction, calling it ‘a shining example of constitutional policing’. While the media largely swallowed the hype, some disturbing stories emerged. Reports trickled in about the police beating and kettling protesters in the streets while the handpicked ‘pool media’ were being distracted by the choreographed eviction. Photojournalist Tyson Heder was beaten on live TV. Patrick Meighan, a writer for The Family Guy, wrote a harrowing account of his arrest during the raid, which immediately went viral. All told, 292 people were arrested, many held in inhumane conditions, deprived of food and bathroom facilities, and saddled with punitive bail amounts of $5000 or more. The LAPD subsequently admitted to placing a dozen undercover cops in the camp, citing the alleged presence of ‘domestic terrorists’ from the fringe Black Riders Liberation Party and Sovereign Citizen movements. Bizarrely, invoking colonialist parallels, the LAPD also claimed that protesters were fashioning bamboo spears to defend the camp. The LAPD have produced no evidence to back up these claims, and the media has largely ignored evidence of police abuses in the wake of the eviction. Meanwhile, the LA City Attorney has suggested that he might seek a restraining order against 46 of the occupiers to keep them away from City Hall, shamelessly comparing the activists to husbands who beat their wives. Despite all of these betrayals, Occupy LA has continued to work with the city on passing another feel-good resolution – a unanimous rejection of corporate personhood. Occupy LA’s faith in the police seems to have survived intact, too. As stories of police abuse from the raid began to flood the #OccupyLA hashtag on Twitter, one member of the organisation’s media team warned against ‘engaging in a campaign against law enforcement … (we) can instead build bridges with LAPD and encourage them to lay down arms against us’. While Occupy LA seeks to build bridges, I suspect that the city is already hard at work building its next Trojan Horse. Matt Cornell is an artist, performer and film programmer. Matt lives and works in Los Angeles and blogs at My Own Private Guantanamo.